I’m sure you’ve seen those message bars at the top, or sometimes the bottom, of a website. They’re commonly used for cookies notifications, to alert users of promotional offers or to sign up for a newsletter. If you have searched for hours to learn how to create an easy notification bar then this could be the best solution for it. Moreover the plugin can be used for a wide array of designs like newsletter boxes, logins, countdown timers and much more. So if you continue reading this article, I’m going to show you how to create awesome bars for your Divi website by using the simple yet powerful plugin, Divi Bars. What are DIVI Bars and How much does it cost? How Do I customize the DIVI Bar? How does the Divi Bar Look? What is Divi Bars and How much does it cost? Divi Bars is a simple plugin that adds an extra bar to your website by simply using a Divi layout. It gives you the ability to use any type of content you want and offers a high degree of customization allowing you to make it small, large or changing the position to the top or bottom of your website and you even have the option to appear based on a trigger. It also allows you to integrate with third-party email marketing platforms like MailChimp, Mailerlite and many many more. if you’re looking to add a message bar to your website without breaking it then Divi bars is a great option to do that. 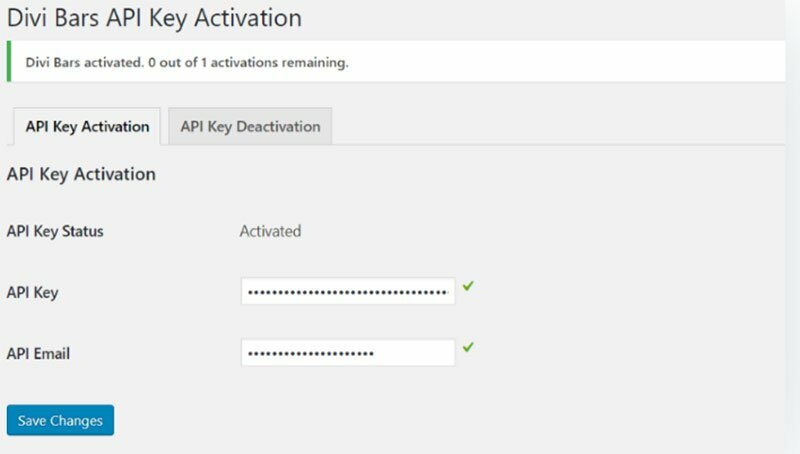 You install Divi bars like any regular plugin and then use the API key in your Difi Life “Account Area” to activate and use it. In this section, I’ll go over the basics of using Divi Bars, so be sure you are comfortable using Divi before you get this plugin as it requires some knowledge of the theme. A good place to start is the Divi documentation. 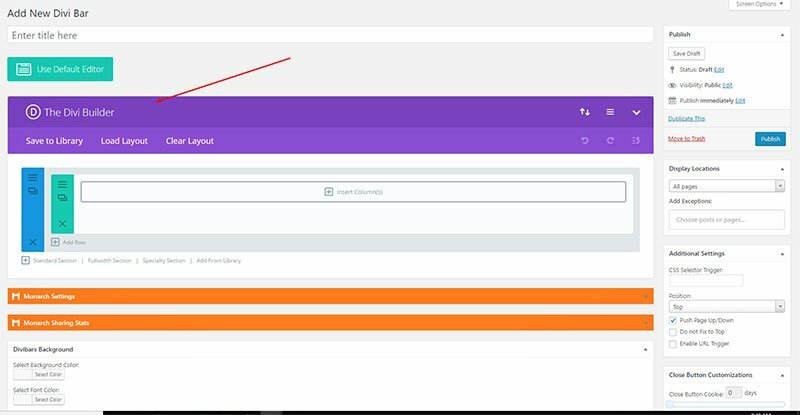 Go to Divi Bars > Add New and you’ll see the options below where you can create a Divi Bar which is very similar to creating a page or post. You have to set an Automatic trigger to “none” it will not display the bar you’ve created to change this to your preference for instance “timed Delay” with a specific time delay of 0 seconds. If you’ve been using Divi and are well aware of how to design using its modules then using Divi Bars is a breeze, as it uses the very same Divi builder to customize and style the bars. 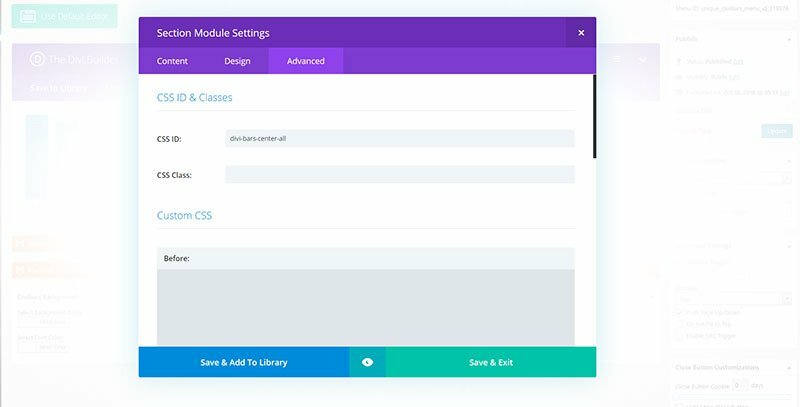 In fact, it’s the same as creating a normal layout and you can pretty much use any module from the Divi Builder! The Divi Bars background allows you to choose the color of the background and the font as well as further customizations like opacity etc. Whether you want to position it to the top or bottom and customize how it is triggered. This sets the number of days the cookie will last and also allows you to customize the close button in the cookies bar with a real-time preview option. 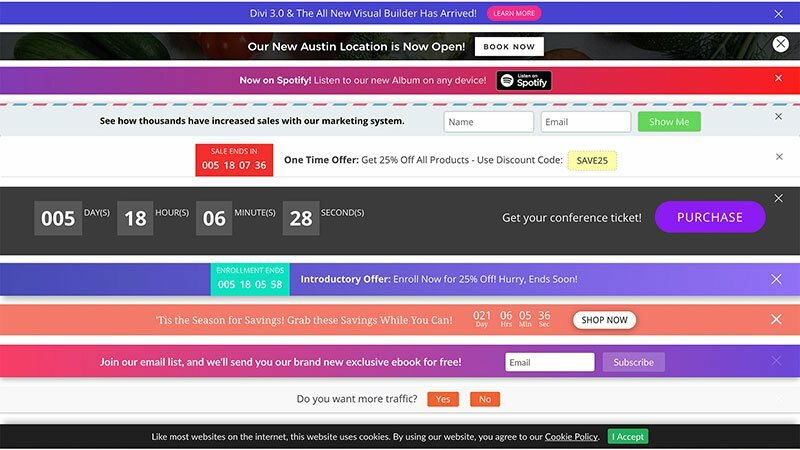 This lets you customize how the divi bar will display. Each trigger has its own setting also if you leave it to “none” it will not display the Divi Bar. Specifies the time delay before the Divi bar is triggered. Setting it to 0 will display it instantly. This will display the bar when the user’s mouse moves to the address bar. You also have the option to disable on mobile and customize how many times to display per page load. If you aren’t really into creating Divi Bars from scratch and want something pre-made like the pre-made Divi Layouts you’re in luck because Divi Life has a whole multitude of pre-made Divi Bar templates to choose from. 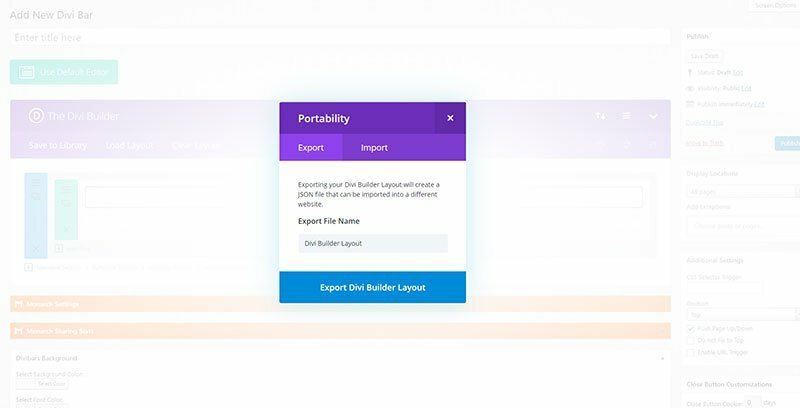 You simply go to your Divi Life accounts section to download the desired layout and import it into the Divi Bars Layouts Page builder using the Divi Portability tool. Can I use CSS to customize it further? 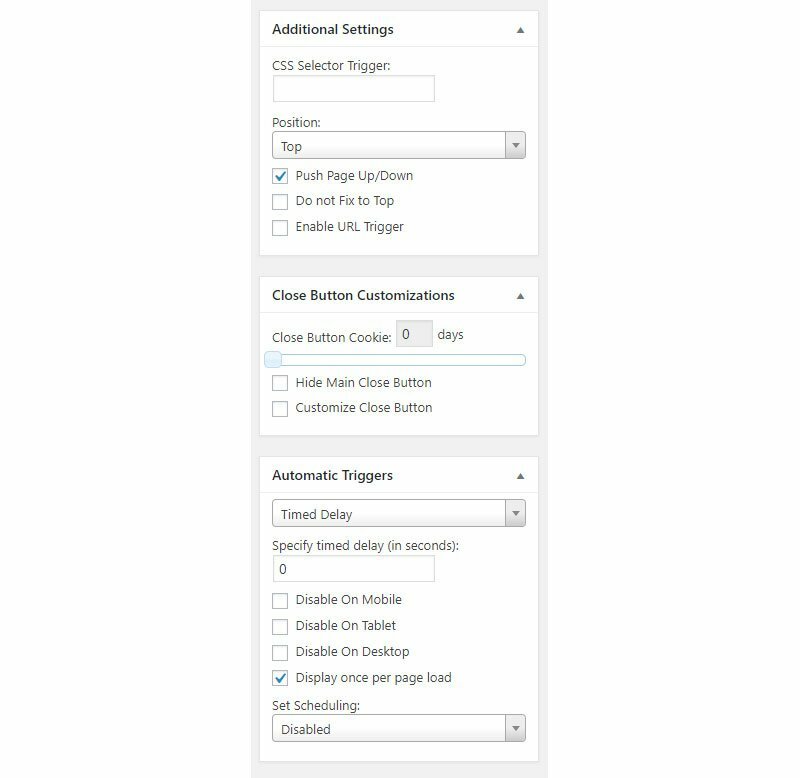 If you have issues with the padding or something else simply add your own CSS via the theme settings or within the section itself like how you would whilst designing a specific layout. Ok, that’s enough talk about how to use Divi Bars, let’s take a look at it in action. As you can see the possibilities are endless and you can create a bar for almost anything. If you don’t want to create one from scratch then you can simply pick one from the wide selection in the Divi Bars library. After giving Divi Bars a try I think it’s an absolute no-brainer if you want to create bars for your Divi website. Moreover, Divi bar is not just for good looks but for conversion rate optimization (CRO) as the triggers if customized well can really work towards increasing engagements and ultimately increase sales! Divi Bars is also an excellent tool for adding message bars like cookie disclaimers, shipping rates and other call-to-actions. So are you going to get Divi Bars and increase your sales? Let us know in the comments below. If you are a Divi plugin developer and you would like to have your plugin featured on Divi Theme Examples, drop me a line via the contact page.